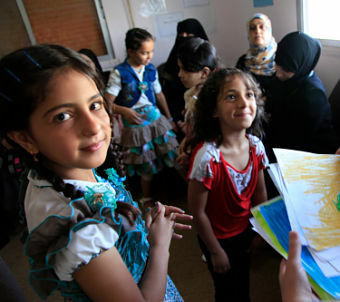 Refugee children from Syria at a clinic in Ramtha, northern Jordan. DFID UK Department for International Development. flickr cc. If, like me, you want to put the current ‘refugee crisis’ into some kind of historical perspective, then I recommend Tony Ward’s recent publication, Bridging Troubled Waters: Australia & Asylum Seekers. This is a well-researched and readable review of Australia’s response to refugees arriving here by boat since the 1990s. This timely book is a project of the Yarra Institute for Religion & Social Policy within the University of Divinity, and was funded by Good Shepherd Australia New Zealand. Yes, hard to believe that, for nearly two decades, we have been shouting among ourselves and at each other about whether to ‘let them in’ or ‘keep them out.’ You can regard the media and political reactions over these decades as amounting equally either to successful ‘border control’ or to ‘national shame’. These remain troubled and turbulent waters, indeed. In recounting the history, Tony Ward seeks to find common ground, to build a bridge, as it were, between two opposing sides. He begins by pointing out that, in the twenty years to 2016, Australia has become home to nearly 250,000 refugees. On reflection, this has been win:win for the great number of refugees who have gained new, safe lives, as well as for Australia, a rich and diverse culture with continuing economic progress. Once here, migrants’ integration, says Ward, is essential; poor integration of refugees (and all migrants) creates poor outcomes, community mistrust, and fear. And it’s boat people, in particular, that we have come to fear. Vastly surpassing the number of refugees coming here have been record migrant intakes, sometimes up to 200,000 people annually. Lots of people have been coming to Australia to reside permanently. With continuing longstanding goodwill, such intakes will continue. Yet it is boat arrivals which have generated the most Australian angst. Strange, really, given boat arrivals constitute only 14% of refugees in the past 20 years. Somehow, they are seen as ‘bad’, while aeroplane arrivals are acceptable. And, worryingly, boat arrivals have been the lightning rod for arcing up continuing controversy over migration, with 60% of the population approving boat turnbacks and mandatory offshore detention. Conveniently, we forget that there are an estimated 60,000 visa ‘overstayers’ here, compared to the 2000 detainees on Manus and Nauru islands. Bridging Troubled Waters looks at how we fell into this seemingly contradictory and inhumane attitude towards boat arrivals. Ward looks first at the ‘push’ and ‘pull’ factors in refugee movements. You can easily imagine the push factors living in Afghanistan, for example, particularly if you are of the wrong religious sect or ethnicity. Push predominates in this instance, rather than any ‘pull’ factors, otherwise simplistically understood to refer to Australia’s ‘generous’ welfare arrangements. Those maligned ‘queue jumpers’, however, we treat dismissively as economic not genuine refugees. Yet 90% of boat arrivals are eventually found to be genuine refugees, defined as being a ‘person who has a well founded fear of persecution’. Nevertheless, we fly them off to Nauru and Manus Island, and delay their processing as ‘mandated’ refugees. All this is accepted bipartisan political policy. What we know and keep being told by our politicians is that this offshore detention policy has been successful. The boats have stopped. Ward reminds us, however, that it was not that long ago that refugee boats were welcome. Remember the Vietnamese arriving in the 1970s, the Cambodians in the early 1990s? But by 1999 and the ‘Tampa’ incident, that attitude went into reverse. The boats were no longer welcome, and the issue was no longer a humanitarian response but one of border control. We became fearful of being ‘invaded’ by Afghans, Iranians, Iraqis, Sri Lankans, and anyone else aboard those boats. Processing these people’s claims for refugee status shifted progressively from community detention to inland detention, and now to offshore detention, with increasingly punitive measures coinciding with the ‘waves’ of arrivals. As Ward points out, there have been only four such ‘waves’, barely an international observable ripple, compared, say, to the European tidal wave of dispossessed humanity turning up onshore and overland. Much of this book charts the history of the fevered political reactions to these ‘waves’ of refugees … John Howard’s electoral victory in 1999 on the back of Tampa, to Kevin Rudd’s backflip from first letting them in but then offloading them to offshore detention. Then Abbott’s amped-up political aggression towards boat arrivals, to the current confusion over the centres on Manus Island and Nauru. These centres are either open or closed, or closing, depending on who you listen to, but still with their resident refugees. Ward highlights the consequences of all this disordered reaction. There has been huge financial cost – think billions of dollars. Think also of the damage to our international, especially regional, reputation. Unforgiveable, though, is the psychological damage caused to the people we have incarcerated on these prison islands by giving them no hope they will one day be resettled elsewhere. Naturally, there is despair, desperation, self-mutilation, and suicide. Now they are the ‘damaged goods’ we are belatedly trying to offload to other nations. We remain consistent in not wanting them here. It is not that we are unaware of the damage we have been doing. Ward cites numerous official reports from Parliamentary Select Committees, Joint Standing Committees, the Australian Audit Office, the Human Rights Commission, Amnesty, and the UNHCR, as well as individual stories. It is the last, I think, that have largely been missing in public. We have been denied the personal stories of these people and their quite heroic efforts leading to their arrival in PNG or Nauru. Had we heard their stories, our response to them may well have been more humane than it is. Instead, the next time you visit an airport, you can see the official secrecy and paranoia at work. Just look at the prominent para-militarisation of the customs service, now menacingly renamed BorderForce. Having given us the history, therefore, what does Ward recommend? To begin with, he argues that we should maintain tight border security. Fair enough. All countries have the right to say who and on what terms people can enter. John Howard did not invent that; it’s in the migration legislation of every country. And countries patrol their borders. But a ‘fortress view’ has become a turn-back-the-boats policy under the specious reason of saving the passengers from drowning, when really we don’t want them, just as we refused to assist resettlement of the boatloads of Rohingya fleeing Myanmar a few years ago. Deluded and safely separated by sea, we think it’s Indonesia’s problem, created by their lax Muslim visa-free entry, their evil people smugglers, corruption of all kinds, and all the rest of it, fuelling Australian xenophobic prejudices. We need, says Ward, financially to support the 14,000 refugees in Indonesia. That number is far fewer than I had been led to believe was ready to overrun us. In a population of 265 million, what Indonesian government would be worried about shedding some or all of those 14,000 people by sea in the direction of Australia? Supporting Indonesia’s refugees makes sense, and helps maintain good relations, diverting any suggestion we should set up a regional processing centre here. This kind of cooperation needs to go hand-in-hand with the UNHCR and IOM organisations’ assistance to refugees. As for refugees who do make it to Australian shores, rather than spitefully punishing them with tough and temporary visa conditions, let us lighten up those conditions to help them reclaim their lives and settle successfully, for example giving them the right to work. Finally, Ward advocates for the real and permanent closing of the processing centres on Manus Island and Nauru, and resettling the people detained there in other nations. Since its initial offer, New Zealand would by now have taken 1600 of these refugees. Arguably, the boat turnbacks to Indonesia have achieved the ‘safe borders’ without the add-on of sending them to Nauru and Manus. Offers have been rejected from other countries to take some of the refugees from there, the Australian government shrilly claiming this will only encourage a resumption of the evil people smuggling business. Yet neither the intended Cambodian nor the recent USA resettlement ‘swap’ has prompted the boats to relaunch from Indonesia. Clearly, a number of waters need to be bridged, beginning perhaps with our perceptions that boat arrivals are really numerically few compared to the number of refugees who arrive here by other means. The boat turnbacks are not really some kind of naval national surf life-saving exercise to prevent drownings at sea. Nor is the despatching of the boat passengers to Manus and Nauru sending a warning message to the evil people smugglers to cease business. Ward thinks we are at last waking up from being repeatedly told such national self-serving fabrications. In fact, Ward thinks that, at last, after two decades of debate, there are now good prospects for achieving the goals shared by both sides. Perceptibly, the fog may be lifting, and the start of a bridge can be discerned. We just have to cross it. What’s keeping us? he concludes. See if you agree, as I did. Read this book. Australian Scholarly Publishing, Melbourne. pp 252. RRP $39.95. Professionally footnoted, with bibliography and index. Tony French is a Melbourne lawyer and member of the Board of Social Policy Connections. He is a regular contributor to Social Policy Connections’ newsletter.